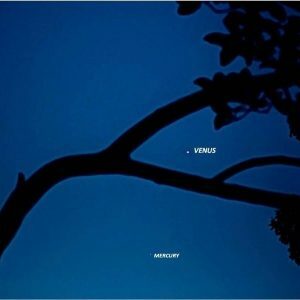 On April 12, 2019, you’ll find the moon at or near its half-lit first quarter phase and in the vicinity of Castor and Pollux, the two brightest stars in the constellation Gemini the Twins. 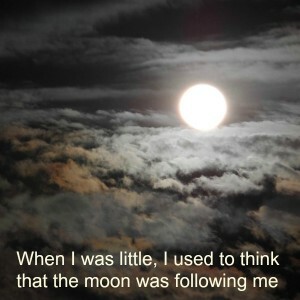 And there’s another bright star on the other side of the moon on April 12. It’s Procyon, the brightest in the constellation Canis Minor the Lesser Dog. Procyon would be hard to pick out without the help of tonight’s moon, or a good constellation chart. On the other hand, Castor and Pollux are extremely noticeable in the night sky. No other two such bright stars appear so close together. 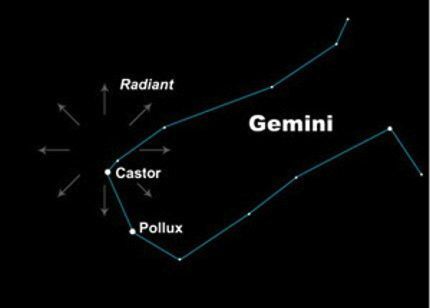 Regardless of the seeming connection between these two stars, Castor and Pollux aren’t close together in space. 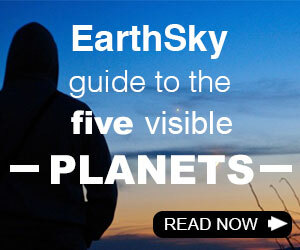 They just happen to reside along the same line of sight from Earth. Both Castor and Pollux are bright stars, and they’ve been known as Twins for centuries at least. But they don’t really look alike. Pollux is golden in color, and Castor is pure white. If you have binoculars, they’ll help you to more easily distinguish the color contrast between Castor and Pollux. Also, Castor and Pollux are different kinds of stars. Castor is a hot, white-colored star that is well known for being a multiple system. It consists of three pairs of binary stars, that is, six stars bound together in an intricate gravitational dance. 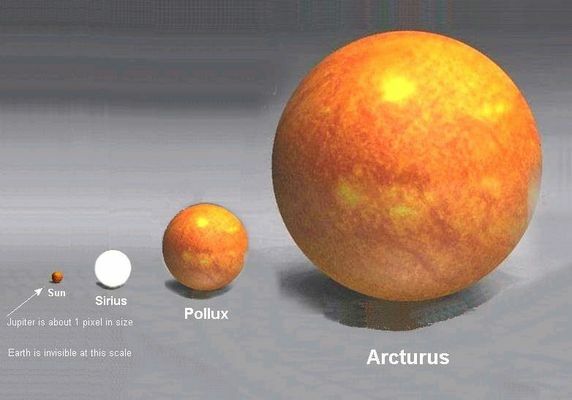 Pollux is a cool and bloated orange-colored star, said to be the closest giant star to Earth. A star swells up into a giant in its old age. The moon passes in front of Gemini for a few days every month. On this particular evening – April 12, 2019 – the moon crosses the ecliptic (Earth’s orbital plane) at its ascending node about one hour before the moon reaches its first quarter phase. The sun, on the other hand, passes in front of Gemini for one month each year, from about June 21 to July 20. You can see the comparative size of the star Pollux and our sun in this image, as well as some other stars. Pollux is a giant star by virtue of its age. Many stars – including our sun – will swell to the giant stage as they age. 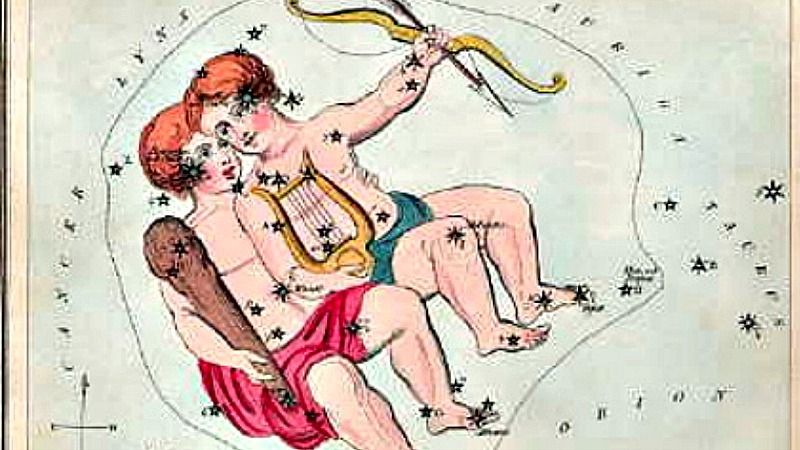 In many cultures, Castor and Pollux were seen as twin stars, usually as heroes. Many old sky myths invoke the idea of twins to explain their proximity on the sky’s dome. If you have a dark sky, notice that 2 nearly parallel streams of stars extend from Castor and Pollux. These stars likely reinforced the idea of twins, in various cultures around the world. 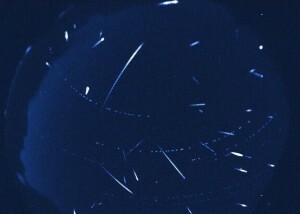 Every December, the Geminid meteor shower radiates from near star Castor in Gemini. Castor and Pollux mark the starry eyes of the Gemini Twins. Image via Wikipedia. 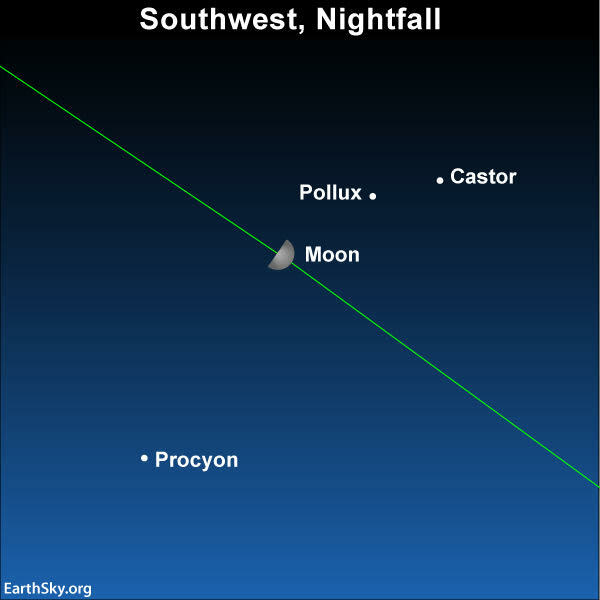 Bottom line: The moon is near the stars Castor and Pollux in the constellation Gemini the Twins on April 12, 2019. These stars represent twins in many cultures.